We have once again been on the receiving end of UEFA’s wrath after both ourselves and Sevilla were charged over various incidents at Wednesday night’s Europa League final in Basel (via BBC). The two sets of fans came together in an unsegregated section behind one of the goals. Punches were thrown and riot police had to step in. 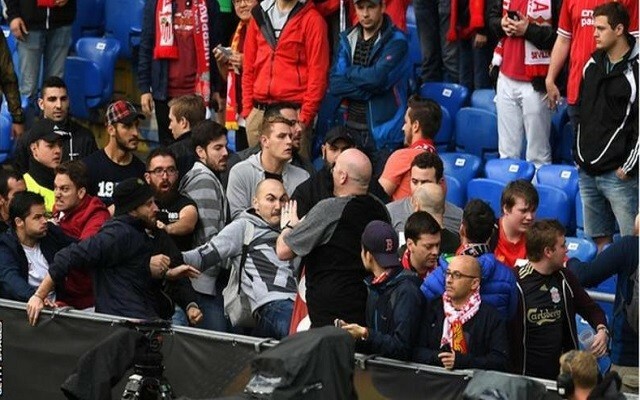 According to the Mail, trouble flared up when Liverpool fans managed to get their hands on some of Sevilla’s unused ticket allocation. They also report that the Sevilla fans involved were wearing t-shirts with “Ultras” emblazoned on them, suggesting this could be a result of people out looking for trouble rather than ordinary supporters. Apparently, we’ve also been charged with “setting off of fireworks”. It’s the second time UEFA have thrown the book at us this season – after the games against Man Utd in the last-16 we were charged with illicit chanting, setting off fireworks, throwing of objects, crowd disturbances, and a late kick-off (via Telegraph).